Just as we soak our moods to the atmosphere which is so appealing,we get one after another Wadis , Ruined City of Qalhat,The White Fins Beach,Sinkholes, and finally Muscat! 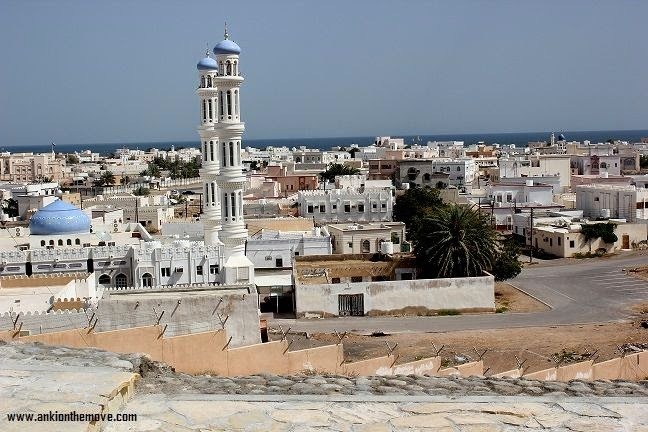 The ancient city of Qalhat was up until the 16th century,one of the most important in Omani coast as the second city of the kingdom of Hormuz,serving as the major commercial hub in the Indian Ocean Trade.In 3rd century,Qalhat was destroyed by the Portuguese,they bombed the city and also in the 16th century there was a Tsunami so half the city was soaked under water.The ruins of Qalhat include BB Mariam Shrine(Bibi means "free",in Persian means Queen) who is said to be a women who built the mosque made of corals and foundation made of stones,which some historical sources mention she was governor of Qalhat during the reign of King Hormuz.The excavations are still going on,where they have found canons,potteries and skeletons. 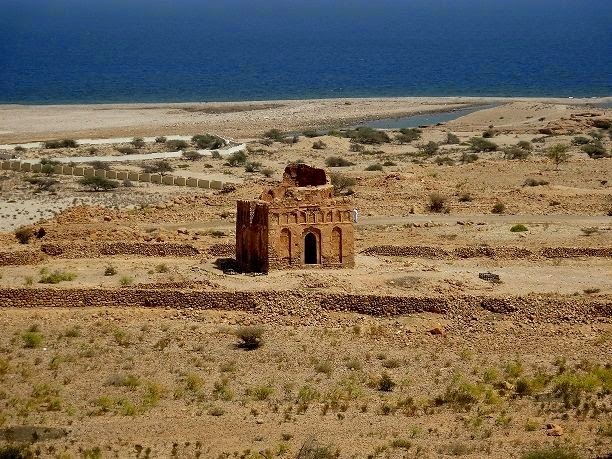 Built in 1770's after the Portuguese left,Sunaysilah Fort has four watchtowers.In earlier days,people used to watch for the enemy through those watchtowers. Quran School,Prison and Mosque are also present there for the Soldiers.We saw interesting stuff made out of fibers of Date like baskets etc. 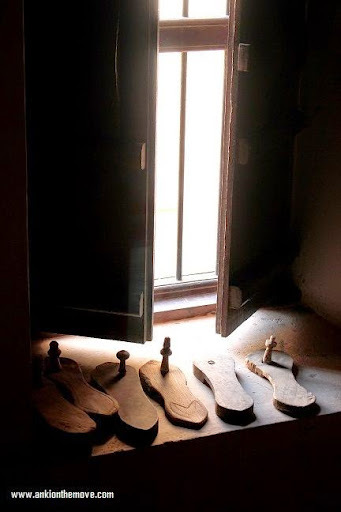 We saw Padukan wooden chappals which I presume in Indian context the lord Ram wore(called Kab in Omani language).Since Zanzibar was Omani colony,we saw Rhinoceros shield made of leather and wood in the Fort. On the Muscat Sur highway,is the popular white sand beach in Oman.It is said hat the Fins beach is formed as the cyclone from the wadis washed the beach and hence the beach has many corals and stones(specially Quartz,Sulphur) and hence the color of the beach is white.You can in fact collect natural corals,shells in various shapes and designs right at the beach as we did.Due to the aquamarine waters of the sea,coupled with white beach,the snorkeling here is incredible. We discussed a bit of Wadi(Wadi Bani Khalid and Wadi Nakhar) when we discussed Nizwa.I also told you how refreshing it is to swim in one of those natural river beds.Wadi Shab near Sur,is one of the best places to swim in Oman.To reach the actual Wadi Shab,you need to take a boat of 1 Rial to the other bank from where the beginning of the hike through the canyons start.45 minutes walk and you get to the wadi.In one of those wadis,there is a small cave,where many people dare to peek in inside (which is a swim stretch without holding onto the cave as they are slippery and the stretch is deep) but the swim is worth it because at the end you get to see waterfall inside the cave. Above the Gorge at Wadi Shab near Sur in Oman, Red Bull Cliff Diving World Series took place in 2012. Wadi Tiwi is a wadi where the cyclone came in 2007 and washed away the date palms and mango trees.The wadi makes an interesting drive through narrow streets of Tiwi village which takes you in to the wadi which had little less water when we went than usual. 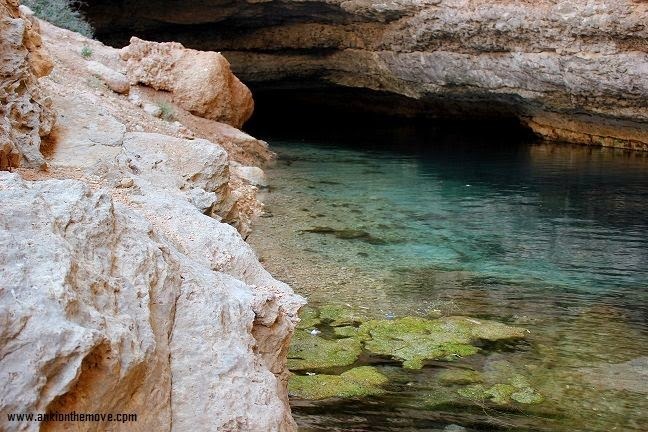 The official name of this place is Hawaiyat Najm Park.It was one of the highlight of the day of my tour.I totally loved this place.Never had I seen a sinkhole where you can swim. 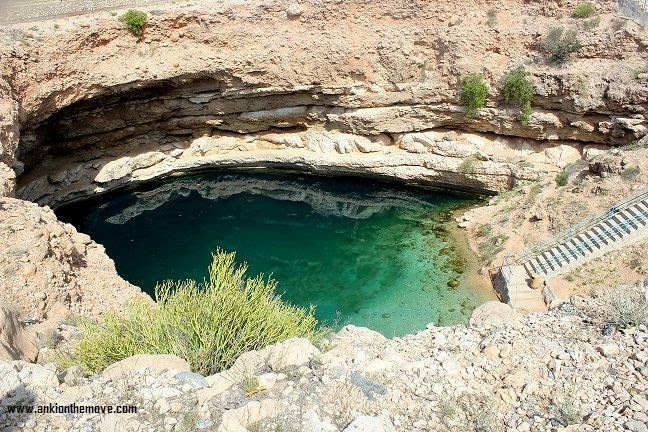 So the story goes with the locals that the Sinkhole is created by a meteorite and hence it got its name as Hawaiyat Najm Park(Hawaiyat means from the air,and Najm means Star in Arabic).But the fact is,that a depression is created from the sea nearby and hence the sea water is now part of the Sinkhole.This is apparently due to a connection of the sea through an underground Tunnel. It is best to change clothes,when entering the park where there are changing rooms.When you enter the Sinkhole(as in actual pool) there are no changing rooms.A series of stairs lead you to the bottom,where you can get right in , swim,or sit on the corals which feels warm or get nibbled by the various small fishes sitting on one of those rocks by the Sinkhole.The Sinkhole is 40 meters wide and 20 meters deep and has perfect visibility and you can see the bottom very clearly.A must must visit place. All in all,Oman still is one of my favorite countries to visit.What about you?Have you been to Oman?If yes,share your stories. Gorgeous photos. That sink hole is calling out to me. 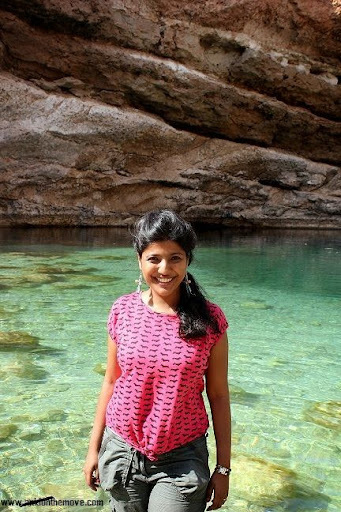 Oman is such a beautiful country… and like you said its a great off beat destination. @Chaitali Patel: Well chaitali,its very welcoming country to do n see.with now Oman air going to Oman cheap,there's no reason v shud miss this one. 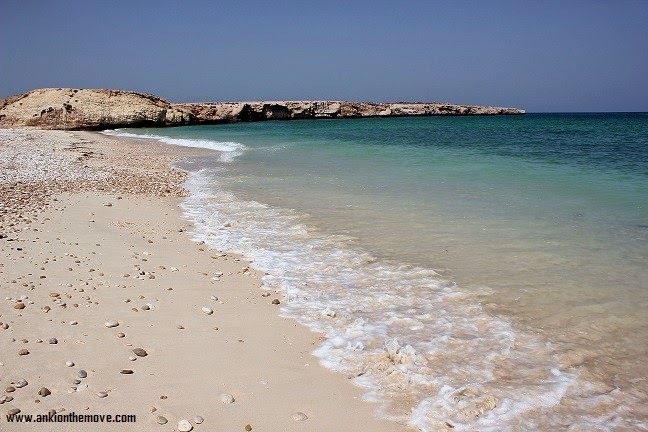 Have never been to Oman .... but its definitely on our wish list ..